Wright State productions take place on campus in the Creative Arts Center, which brings together the fine arts disciplines in one place, including Theatre Arts, Music, and Art and Art History. The Creative Arts Center contains three unique performance spaces for theatre productions, where students demonstrate their talents as actors, dancers, directors, musicians, designers, stage managers, and technicians. Large-scale theatrical performances and dance concerts are presented in the Festival Playhouse (also known as the Robert and Elaine Stein Auditorium), which offers excellent sight lines and acoustics in an intimate atmosphere. The Playhouse features a large main stage comparable to many Broadway and regional theatres, offstage wings and storage areas, and a hydraulically adjusted orchestra pit. The handicap-accessible auditorium seats 376 on the main floor and in the balcony. The Herbst Theatre is a large, flexible performing facility, seating from 70 to 100 audience members. This unique space, often called a "black box" theatre, can be configured to host a wide range of actor/audience configurations, including proscenium, three-quarter-thrust, and in-the-round seating. Productions in the Herbst Theatre often "complement" the season of shows in the Festival theatre with a wide range of theatrical presentations, from classics such as Sophocles, Shakespeare, and Chekhov (such as "Uncle Vanya" featured in the above photo), to modern musicals (such as "A Little Night Music" and "Spring Awakening"), to world premiere experiemental theatre pieces, and contemporary 'cutting edge' scripts, such as Neil LaBute's "The Shape of Things" and Tony Kushner's "Angels in American: Parts I & II." The Directing Lab is a 92-seat proscenium theatre, available to any theatre arts major who wants to rehearse and present his or her own theatrical production. This modern, fully equipped theatre has hosted a variety of productions, from modern dramas to one-person shows, from musical revues to original scripts. This Directing Lab presents an unique opportunity that few theatre programs in America can offer: a totally student-run performance space which is usually a hive of theatrical activity every weekend of the school year with student directed, designed and acted productions. 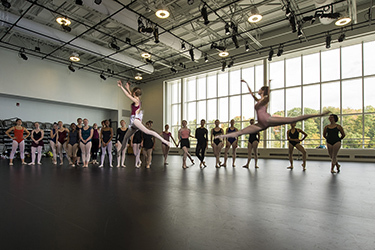 The multifunctional dance studio — featuring performance-level sprung flooring and dramatic floor-to-ceiling windows — is used daily for courses in ballet, modern and jazz. It can also be converted to a dance performance space with specialized lighting, audience seating and dressing rooms.